A couple of days ago, I was chastised by someone who read one of my blog entries. She was "flabbergasted" by the fact that I call myself an "English language tutor." You can read her full Comment and my response here: Expressions for Physical Descriptions (look at the Comments section of the blog entry). I was reminded of a college professor I had for a Research class in the mid 1980s. He was an older gentleman who had "old-fashioned" ways and ideas. Although it was a Research class (with papers and statistics and such), he would often take the opportunity to tell the class what he felt about the issues of the day. One class, he went on a tirade about how we should only use the generic "he," "his" and "him" in our research papers. He told us how he felt about the use of "he/she," "s/he," or even "he or she," and other such variations to include the female in our writing. He believed that the masculine pronoun should continue to be used in all cases and that what the "women's libbers" were trying to do to the English language was ridiculous. I have some thoughts that his concerns were not solely about "the English language." He may have had some issues about the changes in the world that were occurring around him. If one studies the English language (through formal study or merely through observation), one will notice that the English language is changing (maybe even "evolving" in some cases). It is not a static language. If it were static, dictionary writers would not be adding new words every year. Nor would they provide "Usage Notes" (as Longman's does) about the changing language. (See His, Hers or Theirs. ESL students need to be taught Standard American English (in the U.S.) so that they will succeed in school and work. However, English language learners also need to be taught English as it is spoken and as it is used by native English speakers. Many of my advanced English students have intensively studied English grammar in their home countries. Many have told me that they did not understand what people were saying and they had trouble making themselves understood when they first came to the U.S. After living in the U.S. for a while, they caught on, but mostly by context. However, they were not able to replicate the English words, expressions, reductions, etc., that they heard. My students who are professionals are able to do their jobs effectively, but when it comes to making small talk and hanging out with their colleagues, they feel lost. It's as though the native speakers are speaking some other form of English. It is at this point that many English language learners turn to me. They want to "speak like native speakers." They want to fit in. They know formal English. And now they want to learn to speak as their colleagues do. Yes, it is important to ensure that non-native (and native) English speakers know formal English. However, from my experience, it is also important that English language learners know how to "speak like the natives." Please help! I am a former French teacher volunteering to teach English to foreign adults. My Chinese lady cannot pronounce the nasal "N" as in nose. She says "L" instead. Is there some way to help her hear and say the sound? Thank you for your email. L, N (and ng) and R are really difficult for Asian language speakers. I've even read that they (some Asian language speakers, Japanese, I think) cannot actually hear the difference. In my experience, I don't spend time training them to hear it, but rather, to say it. What I do is use pronunciation books that have pictures of what their tongues, breathing, lips, etc. need to do to make each sound. I highly recommend the pronunciation book I refer to on this page ESL Textbook Evaluation. It has great drawings (I can't even figure out what some other books are trying to show), and explanations. It also shows you which sounds to teach first (e.g., N, then L, then R). Hi, I have been teaching one-on-one English classes to adults for a while. My classes are usually conversation based with some focus on form. One of my current students is a native French speaker and he has recurring problems with using have/has, do/does, and plural 's'. I correct errors and give him a lot of feedback; however these problems have become somewhat fossilized. I was wondering if you had any advice about how to stop students from making these same errors over and over again. I thought of getting him to write down the error when I correct him, but I am unsure whether this will disrupt the flow of the class too much. Thank you for your time. I have the same problems with many (if not all) of my students. The "s" (either added or dropped) is particularly troublesome. I haven't found any magic key for these three recurring errors. I understand what you mean about not wanting to disrupt the flow. Depending on the purpose of the class, I often don't correct errors each time they're made, but take notes and then review errors every ten minutes or so. I find that some students are more willing to work on specific problems (and actually make changes) if we discuss they "why" of it, or the importance of getting the "s" right or the "do/does" right. I often use humor to stress the importance. Also, if we decide that we are going to specifically work on a particular problem, I get the students' permission/buy in up front and let them know I am going to correct them each time they make the specific error we're working on. I think that by interrupting the speaker each time an error is made, then we can break that neural connection in the brain and start trying to build a strong and correct connection. If you learn of any other suggestions, please let me know! I'm meeting with an ESL student I met a couple of months ago. At that time, we worked on a Personal Statement for college admission. Today, we're meeting to go over how to write an essay. This particular questions comes up over and over again with my ESL college students. So I decided to make a printout of the Outline I recommend that students follow. Of course, this outline will probably require an explanation for the writing student, as it is a guideline and will have to be adjusted according to the type of paper the student is writing. It's easier to explain this to your ESL writing student in person. As I was walking to meet a new ESL student today, I was wondering what she would look like. The majority of my students are and have been Asian. After I write a description of myself to them, sometimes they write back with a description of themselves. It's usually something like, "I'm Asian and have black hair." As you can imagine, this description isn't the most useful, but I usually can tell who a new student is when they walk through the coffee shop door. Today's new student was from France. She didn't provide me with a physical description, but I wasn't too worried. Just curious. Like I said, I can usually tell a new student the moment they walk through the door because they look like they are looking for someone. I mentioned yesterday that I used to write that I have "olive skin." I also (a long time ago) used to write that I had "salt and pepper" hair. While this is also an expression, it's easier to figure out than "olive." So I was thinking about the whole description, "salt and pepper hair with olive skin." I amused myself by thinking about what this would look like in a literal sense. I meet my adult ESL students in a coffee shop. For our first meeting, I send an email with the address and detailed directions to the coffee shop. I also send a brief description of myself. I met a new ESL student and he told me that he wondered what I would look like because he had no idea what "olive skin" would be like. I've changed the wording of my physical description in my intro email! It just served to remind me that no matter how conscious I am of the English language and all it's aspects, there are some parts of our language that are so internalized that we don't even give them a second thought. One of the things I try to impress upon my adult ESL students is how intonation and all it's components are just as critical as grammar, vocabulary, pronunciation, etc. Knowing what words to stress in a sentence and when to pause are important in making oneself understood. I was reminded about the importance of pauses when I saw a sign today that said, "Slow Children at Play." If you've paid attention to this typical sign over the years, you may have noticed that the words have been spaced differently than they used to be. Now, the "slow" is separated from "children" so that it's not read as "slow children" (possibly meaning children with learning difficulties). With written English, it's easier to show the pauses where they need to be. With spoken English, we need to use the pause to make ourselves understood correctly. I make it a regular practice to teach modals to my intermediate and advanced ESL students. I describe modals as those words that give "feeling" or extra meaning to verbs. I also explain how they can be used to sound generally more polite, especially when making requests. However, I limit my teaching of modals when I work with beginning ESL students. Although, I may suggest that they memorize certain phrases like, "May I have a cup of coffee." I'm thinking about modals tonight because I was watching my all-time favorite reality show, "Amazing Race." In short, this is a TV show about pairs of people racing around the world. I love this show because it's yet another way for me to travel vicariously. Tonight, the teams were in Taiwan. Only one of the teams had a member who spoke "Chinese," so most of the others were stumbling along and looking for help from the locals without speaking the local language. One team member asked for directions by saying to a local, "Would you be able to show us?" The American was obviously trying to be polite by using the modal, "would." However, I thought that a more simple way to say this in English would be something like, "Please, show us," or even, "Could you please show us." When speaking to beginning English language learners (not necessarily when teaching, but just when communicating), native English speakers need to find a balance between being polite and the use of modals. 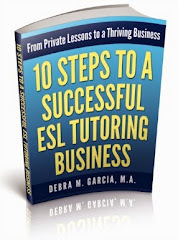 Most ESL schools are notorious for not paying their ESL tutors for lesson preparation time. As a private ESL tutor, I have a little more control over the types of students I accept and how much time I spend preparing lessons (of course, when an ESL teacher or tutor is starting out, he or she spends a lot of time on lesson preparation). Working with ESL students who want to improve their writing skills will almost always take longer than working with students who, for example, want to improve their speaking skills. To do a good job of teaching students, I have to spend a significant amount of time correcting writing assignments for students. To maximize my time as a private tutor, I find that it's more efficient for me to limit the number of ESL writing students I take on. I've mentioned before that most of my adult ESL students are advanced level English speakers. They know the rules of English grammar better than me! Yet, when it comes to speaking and listening skills, my students always have room for improvement. Many come to me saying that they want to improve their pronunciation. 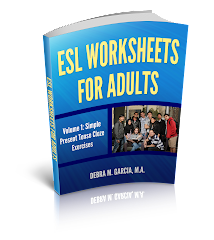 I use a three-pronged approach to teaching adult ESL students "pronunciation." Often, when they come to me and say that they want to work on their English pronunciation, they say that they want to learn how to say different words correctly. Well, this is indeed one of the prongs. The other two are specific sounds and intonation. To me, intonation is perhaps the most important part of pronunciation. I believe that even when someone does not say a word or sound correctly, I (the listener) will still be able to understand the student if the intonation is correct, or nearly correct. On the other hand, perfect word and sound pronunciation with "terrible" intonation is not going to communicate the message of the speaker correctly; not even for a native English speaker. After I show my ESL students how intonation can totally change the meaning of a sentence (using the "red hat" exercise: "I did not say you stole my red hat"), then they start to see the importance of intonation. Often, just the initial awareness of intonation and the "music" of English will help a student to improve his or her speaking skills dramatically. Many of my ESL students are confused about when to use the verb "hear" and when to use the verb "listen." I wonder if this may be because in other languages (at least Spanish--escuchar), the same word is used for both English words. "To hear" is used when a sound comes to your ears. For example, I hear loud music coming from next door. Or, I hear the dog barking outside. Or, I hear the baby crying. "To listen" is used when a person wants to hear something and is paying attention to it. For example, I am listening to a wonderful new CD. Or, I am listening to my brilliant ESL tutor's explanation about verb tenses. Compare, "I was listening to some music when I heard the phone ring." Here, I am actively listening to some music and the sound of the phone ringing was a sound that came to me without my taking any action. P.S. I love the dictionary, Longman Advanced American Dictionary because it knows that students get these two words confused (and many others) and if offers examples of the differences. It's interesting to me how "we" celebrate January 1st as the New Year. I guess what's more interesting to me is that so many of my ESL students celebrate the New Year according to the Lunar Calendar. It just seems to make so much more sense. Or at least many of my ESL students are so clearly able to explain to me the significance of the New Year according to the Lunar Calendar (or the "Chinese New Year" as most of my students call it). Anyway, I wish all my ESL site readers and my ESL students a very Happy New Year.